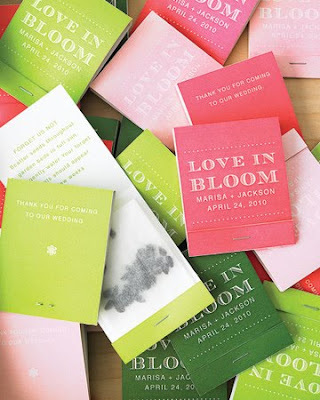 Cammi Lee Events: Fun flower favors! Like I've mentioned before in previous posts, I'm signed up to receive daily emails from the Martha Stewart Weddings site with daily tips ranging from gift ideas, shower ideas, favors, decorating tips and so forth. 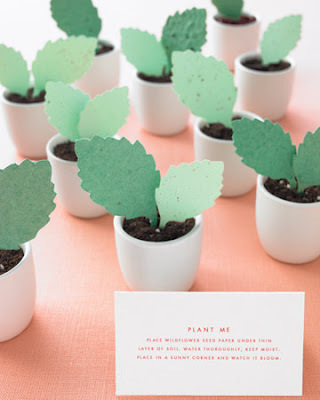 One of the recent topics was flower and plant favors for your guests.... and man, were some of the ideas cute! I've plucked out a few of my favorites to show off, and hopefully inspire you! This is a great idea if you plan on having bundles of flowers at your next event. 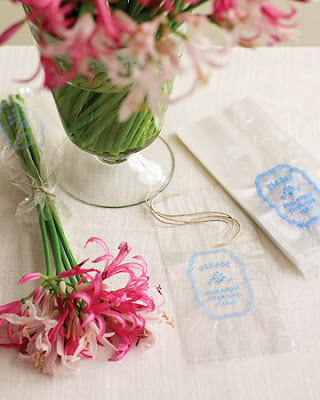 Purchase some small bags, twist-ties and some extra water and allow your guests to choose some stems to bring home. To make it more personal, get a message, your names or a monogram printed on the bags. I think these are soooo purdy! The little pouch has a Dahlia bulb so your guests can plant their own flower! To get a tutorial on how to make this cutie, click here. 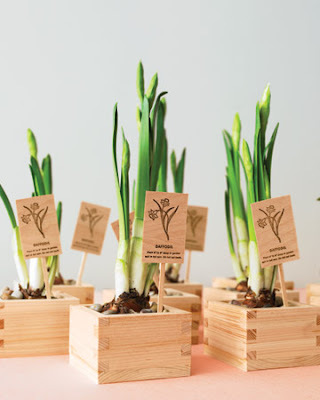 I love these little planted daffodils... but I especially love how they're planted in those cute little boxes! Guests are also able to take these home and plant them for their own enjoyment. I think this would be great for a bridal shower. Give each of your guests one of these to take home and enjoy - I'm sure they'll love it! These little cuties are tulip bulbs wrapped up and waiting to be planted. Those little flowers poking out - yep, they're paper cutouts! 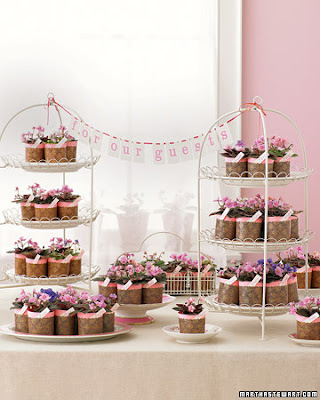 Not only cute as decor for your party (spring garden party, anyone?!) 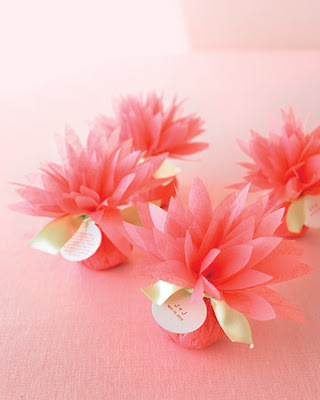 but an adorable favor for your guests to take home. Who wouldn't like a tulip? I know I would! I think this is a cute idea! Inside the matchbook is some seeds to plant. 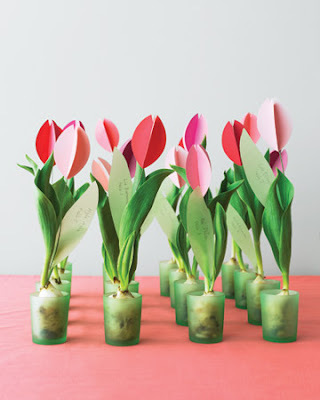 What a great way to personalize your favor while making the earth a little prettier! Another cute little take home for your guests. Include directions on the plant you choose and how to properly plant and care for it! This is great for an outdoor and nature themed wedding! 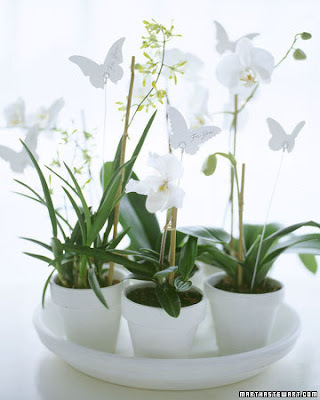 To view more flower and plant favor ideas by Martha Stewart, click here. All these ideas are simply fabulous!